Dendrobium aqueum is an exquisite epiphytic orchid found in Kolli Hills Tamil Nadu, Himvad Gopalswamy betta in Karnataka and Coorg. 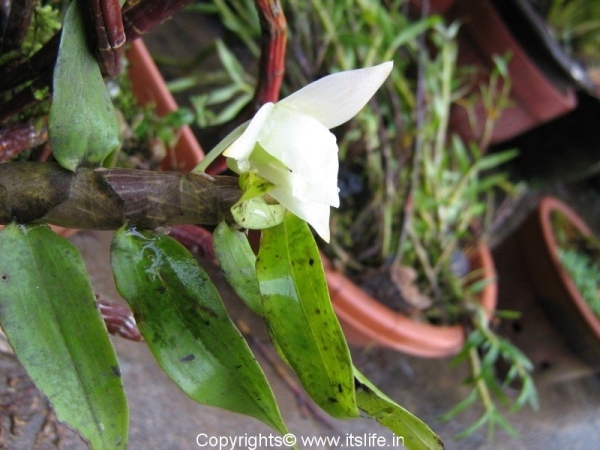 The flowers are White with the lip acquiring an off white color. The plant sheds its leaves and buds appear on the leafless spikes from June to August. It is a delight to watch the flowers bloom on leafless spikes. But there are times when I have seen them bloom on spikes with leaves. After the blooming period, new shoots appear with fresh and healthy leaves. It is fast disappearing from the wild and enthusiastic botanists are collecting the seed capsules and germinating them in labs and reintroducing the plants in the wild. To pot these plants use coal, brick pieces, moss and bark as a potting mixture and keep the plant away from direct heat. 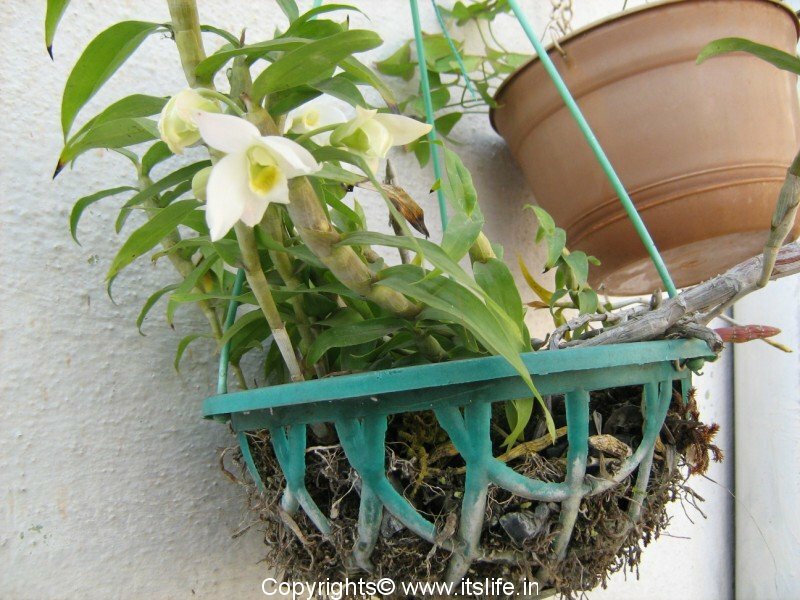 You can use a hanging basket to pot them and hang them. that is a lovely orchid! How fortunate you are that you can grow plants from your very own part of the country and help re-introduce that plant back to where it is native. can you help me make my own potting mix for growing an orchid please? i would appreciate your recipe for making it. 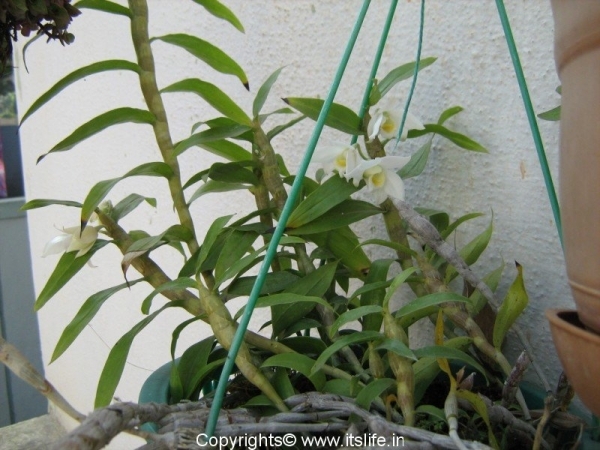 will the bark of a neem tree do? Thank you. But I am not reintroducing the plants back in the wild. It is the botanists who are doing it. I am just an orchid growing enthusiast. 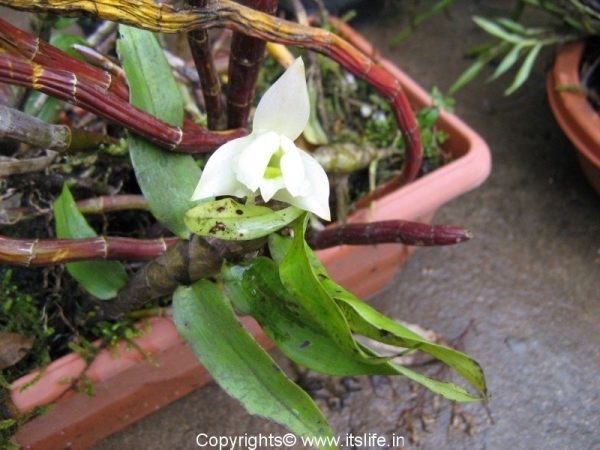 Bark of any tree is fine for potting orchids. 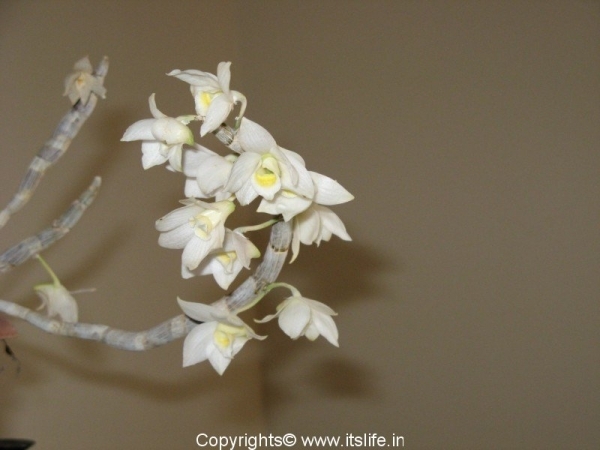 Can you people having Dendrobium aqueum in your gargen contact my email (thibhan@gmail.com)please. I’m working on it.